Tuesday brought news of big changes coming to the AHL in 2017-18. 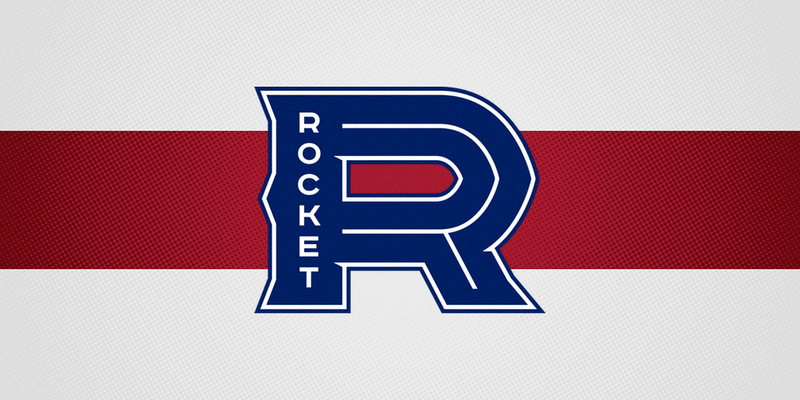 First, the Laval Rocket — affiliate of the Montreal Canadiens — revealed their logos and uniforms. It was officially announced last September that the Habs would relocate the St. John's IceCaps to Quebec next season. Now the branding has been finalized. A big, blue "R" will represent the franchise with a series of other minimalist marks playing supporting roles on the uniforms — including Maurice "Rocket" Richard's own No. 9 on the sleeves of every member of the team. Secondary brand elements are integrated throughout, with sleeve patches featuring a simple brand shield and the legendary #9 worn by Maurice Richard himself. The graphic flame icon propelling his number upwards is also found below the player’s number and on their socks, while the Laval logotype appears on the shoulders and behind the old school jersey neck tie, the only AHL team to do so currently. Every element, from the original bespoke font to the use of the classic tricolor palette builds a bridge between the past and future, creating a brand that is contemporary yet instantly timeless. Truth be told, it's hard not to like this design. And I can't really argue with their "instantly timeless" sentiment. It really does look like a full-on throwback — yet it's completely new. By the way, if you like the 3D template the team is using to showcase its jersey design, you might be interested to know that it is available to download from SportsTemplates.net. It'll set you back about $70 but the quality and level of detail are worth a look. The other big news came out of upstate New York. The Albany Devils will end their seven-year run in the state capital, opting to move west to Binghamton after this season. The Devils have faced their share of attendance issues and Binghamton just lost its AHL club to Belleville, Ont. — as was announced last fall. So this seems like an obvious fit. Even more obvious? The franchise will continue to be called the Devils. This will be the fourth Binghamton-based AHL team to be named after its NHL affiliate going back almost four decades. It began in 1980 with the Binghamton Whalers — who cleverly turned Hartford's classic "W" logo on its side to form a "B" — followed by the Binghamton Rangers in 1990, and up to the Binghamton Senators in 2002. Interestingly (maybe), the business side of the Binghamton Senators franchise will take over the Devils operations due to their "expertise in the market." Perhaps not surprising since the business side seemed to suffer in Albany. By the way, in case you missed it, the Belleville Senators have adopted Ottawa's logo. Another creative choice to be sure, but it's certainly preferable to the cartoons used by Binghamton. So that's at least three teams undergoing branding changes in 2017-18 — but don't forget the Vegas Golden Knights' entry into the NHL will also herald the arrival of a new AHL team to keep the balance between the leagues at 31 teams each. There's been speculation that Vegas could enter an affiliation agreement with the AHL's Chicago Wolves, who are in the final year of a deal with the St. Louis Blues. That would leave the Blues in need of a partner — but they have talked openly about wanting an AHL club in Kansas City. We'll keep an eye on all that as the year progresses.